When Verizon first announced they were releasing a Google Android phone I was hopeful that this would be the phone that would keep me from switching to AT&T (just so that I could get an iPhone). Well, as it turns out that is exactly what they delivered! I picked up my DROID the morning of the release and have been running it through its paces to see what it can do. I have read a lot of the pre-release reviews and they all pretty much said the same thing, so what I wanted to focus on was how it actually worked out in the real world. The first thing they have you do when you’re at Verizon is have you enter a Google account. What happens if you don’t have a Google account? You can sign up for one right on the phone. If you don’t want to sign up for a Google account then you’re going to be missing out on some of the cool functionality that is built into the phone. I have a few Google accounts so it wasn’t a problem for me. I logged in and suddenly my Gmail and Google Calendar were synced to the phone…Nice. So, I know Google Android is behind the iPhone when it comes to apps, but how many “fart machines” and simulated AK-47 apps do you really need to feel superior? As far as I can tell, all of the major apps have already been ported over. Since Android doesn’t lock developers out of a lot of the functionality of the phone, a lot of these apps “power up” when they become an Android app. I am sure there are many specialized apps that haven’t ported over yet, but I don’t think any of them are deal breakers. You might have remembered me mentioning the auto sync with Google Calender, well the DROID can also sync with both your Microsoft Exchange email and calendar which makes it great for keeping up with your corporate email. What about iCal? Why there isn’t a direct sync with iCal and DROID, starting with OS 10.5 you can sync iCal and your Google Calender so it all stays up-to-date. The phone also comes pre-installed with a Facebook app. One of the cool things that happens the first time you sign into Facebook is it asked if you would like to merge the Facebook friends with the contact list on your phone. You get three options; “Sync all”, “Sync with existing contacts”, “remove Facebook data”. I chose “sync with existing contacts” which updated the contacts that are on my phone with pictures, email address and other contact information it found about them on Facebook which was a nice touch. You tell an iPhone user that the DROID has Google maps and they will yawn and say, “Yeah, I have an app for that.” What you should actually say is, “I have Google Navigate.” The new app exclusively for Android phones that, when Google made the announcement it sent Garmin’s stock plummeting 16% in one day of trading and has continued to lose ground. So what’s so great about Google Navigate? Well, take the power of Google Maps, add GPS, turn by turn directions, live traffic information, Google’s local search, a sweet voice recognition system, and you can see why you’d never need a Garmin or any of those other systems that they sell pre-installed in some cars. I have used it a couple of times and though I find my Garmin a little more user friendly, Google Navigate is a nice system. One thing though, Google needs to work on their text-to-speech, that voice is a little difficult to understand. With a 5mp camera I expected the functionality to be awesome. Well, I am a bit disappointed by its performance. I’ve heard a lot of other people complaining about the camera software too. So I am hopeful that Google is working on a update soon. The quality of the pictures are good, but the delay just kills you. A bigger disappointment than the still shots was the video. It was supposed to be a big deal, “DVD Quality” recording in a smart phone. I recently shot this video and I think the results were anything but DVD quality. Hopefully Google is also working on better compression codecs as well. Google Apps: You would think that Google would have made sure that all of their offering would have successfully been ported over as Android Apps, but they haven’t. Google Finance makes you login every time it is launched, Google Listen just gets stuck in a never ending login loop, and Google Reader, Google Docs, and Google Earth are not even available. SMS Character count: SMS messages have a 160 character limit. If you are sending a message to Twitter, it is only 140 characters. Every other mobile phone I have come across give you a character count as you type (Except iPhone and the DROID) not having character count is a pain. Slide out Keyboard: I actually like the keyboard, I just wish they would have done two things differently. Give direct access to the number keys: When I send text messages I still make use of the numbers quite a bit. It is a pain to have to hit an alt key every time you want to input a number. A little more room on the top row: Your fingers have to smash up against the slider in order to hit the top row. Camera Quality: Worth repeating the camera software needs to be improved! This is a great smart phone and it holds up well to an iPhone. The touch screen is very responsive and the screen orientation is faster then the iPhone. (Yes, I ran side-by -side comparisons). Unlike the iPhone, the DROID has a replaceable battery, and removable storage. (It comes with a 16gb microSD card, but can be replaced with a 32gb card.) You can use the supplied USB cable or bluetooth to add music and other files to the phone. The music player works great. Since it is on the Verzion network it has great connectivity and as new apps come online and patches are released this phone is only going to get better. If I had a choice between an iPhone and a Google DROID, I think it would be a touch decision but ultimately I would chose the DROID because of the superiority of the Verizon network, the ability to upgrade the device and the open source aspects of the phone. 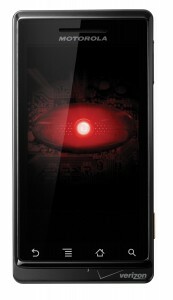 If you have a DROID or are thinking about getting one I would love to here what you think.